You know how you check your blogroll for new posts every day? I've been hoping that somehow, some day, some way my blog would update itself! 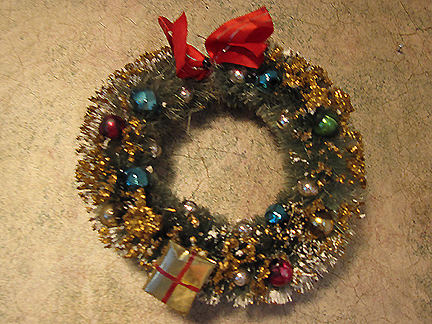 Well, that never happened, so I'll share some decorations I've been putting up around the house. I made a hat and scarf for my pink flamingo (waves to Beckie!). It tickles me no end. My other outside decorations are C4 lights on stakes along my driveway, lighted garlands on my porch railings, a lighted tree on my porch, and a few other lights. I love vintage/retro decorations. 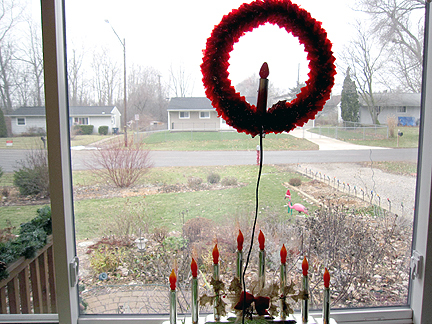 The red cellophane wreath and gold candelabra are in my front kitchen window. 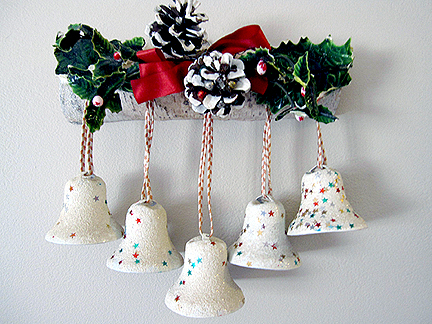 These sweet little bells are in my hallway (the tree branch is real). I love these little bottlebrush wreaths and have several of them in my entryway. I mentioned I like deer, right? Well, I really like deer. Especially these two. The ribbons and bells and white spots are just so sweet! I love this little angel with her own all-around halo. Here's everybody on top of my entertainment center. I love the trees and Santas, too. The larger (5 feet tall) of my two Norfolk Island pines is my main Christmas tree, decked out all in retro ornaments, from the 1960s and earlier. About 10 years ago, I would have found all the retro stuff kitschy and tacky. My taste was more German. 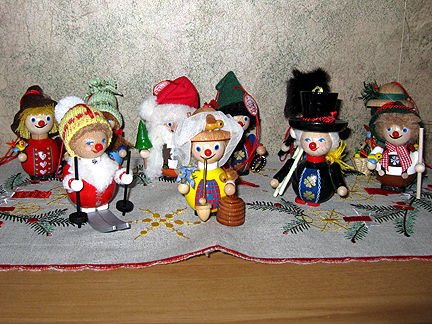 For example, my friend and sisteroo Susan sent me most of these wonderful Steinbach ornaments. Isn't the beekeeper adorable? I still like my German decorations. 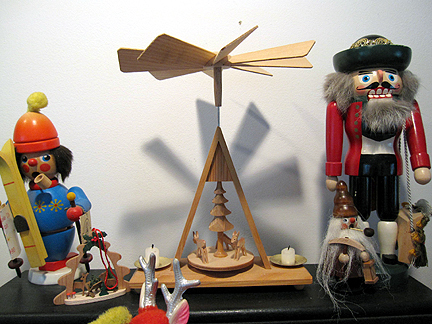 I keep Twirly (pyramid) and Nutty out all year, in fact. The skier and bearded dude are smokers, not nut crackers. They hold incense and smoke comes out their pipes. 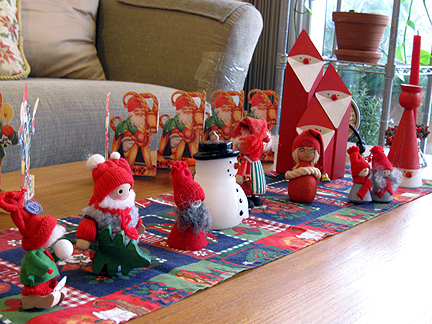 I also like Scandinavian decorations, which grace my coffee table. The little dude to the left holding the tree is my favorite. I really like understated and minimalist design, so Scandinavian things are perfect. I think that's why it took me a long time to warm up to retro American decorations! But now I love both styles! 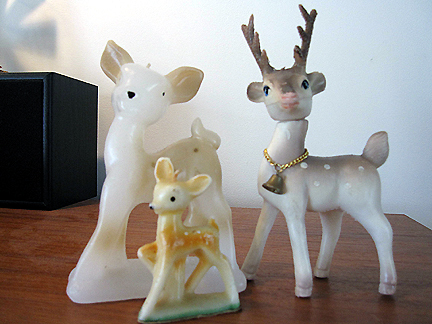 Speaking of tacky, this is my little kitschy korner. My friend Aunita surprised me with the darling salt and pepper shakers, and the rest were bargain finds: I don't recall where I got the mistletoe snowman, but I got all three knee huggers this year: Santa for 25 cents at the Ann Arbor Thrift Store, green pixie for free while helping set up for the Kiwanis Christmas sale ("no one would pay for that, just take it"), and red pixie for 25 cents at Recycle Ann Arbor's ReUse Store. Stay tuned for more of my favorite retro decorations and trip reports from Meijer Gardens and the Chicago Christmas Market! Yours is a very international collection I must say. Love the Scandinavian style and the German too but most of all I love the flamingo, it's a hoot and by far the world's most tackiest christmas decoration. Well done, Monica! Your flamingo is tres chic. All the retro decor took me back a few years. Now do you have the bubble lights? I think I still have one original left from when we were kids. Oh, and the incense holder also stirred some memories--I bought one or two of those on my only trip to Germany years ago. 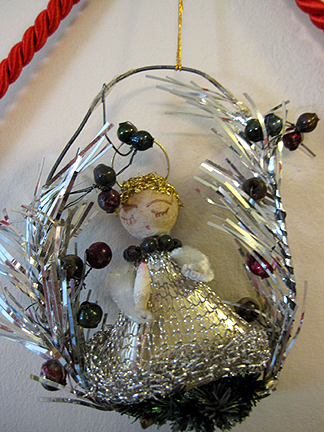 My German is very, very rusty, but I can say, "Frohliche Weihnachten!" 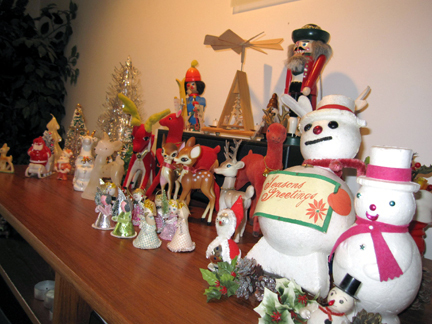 You have a great collection of Christmas decorations! I love the reindeer pair -- so very Rudolph! How fun!! You have quite the collection of Christmas memorabelia! I like your style Monica. It is so you. You could keep your deer collection out all year too. They are sweet. 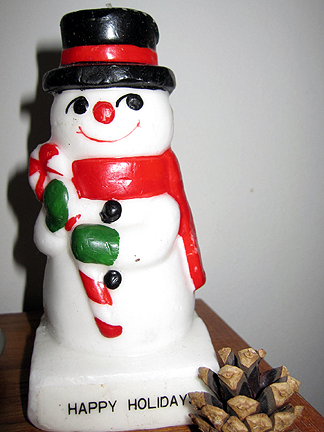 Monica, I love all your retro Christmas collectibles--I love to collect Christmas decor from the past. All of your little deer are very sweet. 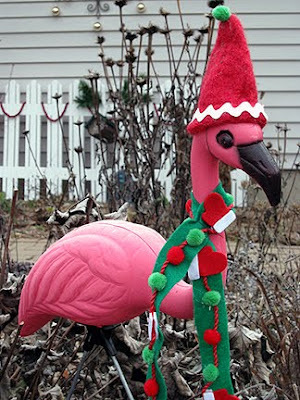 I had to laugh at your flamingo in drag--er--Christmas finery. You really need to move to Austin--you would fit right in. It's looking most festive Monica :) We saw some similar looking decorations to your German ones in Strasbourg. Looking forward to hearing about the Chicago Christmas market. Your flamingo must be the best dressed flamingo in town. Oh I love the pink flamingo and attire! 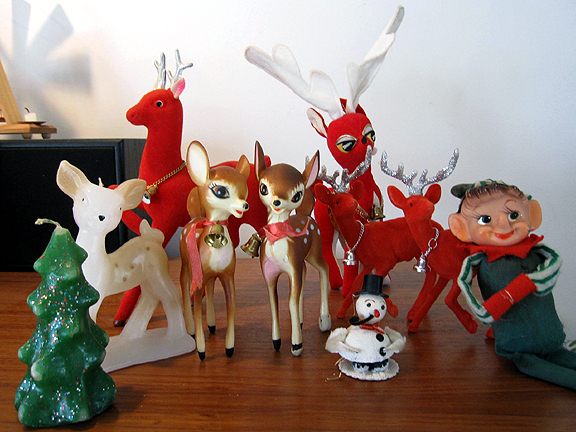 And I've never seen wonderful retro ornaments like these - they're amazing! They are all so varied - such a collection. The flamingo is awesome! I have a secret place in my heart for tacky Christmas decorations. 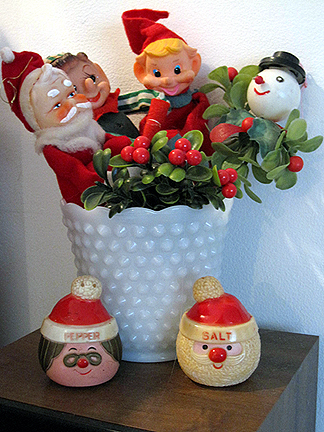 (Must be nostalgia for my grandma's house at Christmas in the late 60s.) You have such fun stuff. I've got a big grin on my face right now. Thanks! Hmmm, your blog updating itself? Now you might be on to something there! 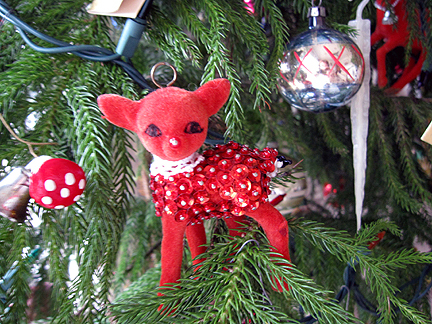 The two little deer are my favorites and the little red deer on the tree is cute as can be. Ha, well, that's one of the joys of having a co-blogger. Twice a week or so, I check the blog and there's a new post. It's just great! And the posts are usually better than I could write, a bonus. The Christmas decoration leaves me speechless...Ueber Geschmack laesst sich nicht streiten. Your decorations are so cute. I especially love the winter flamingo. My sister has a goose she dresses up for the seasons. I always smile when I see its newest outfit. I'll bet poor goose is buried under a ton of snow this morning. I was at the German Market in Nottingham with First-Born yesterday and they had some wooden ornaments very similar to yours for sale ...but I didn't succumb! Monica, thank you so much for your lovely comment! Raph & Maureen have dispatched your cards - hopefully they should get to you in 4-5 working days, subject to Christmas post volume. I hope they give you lots of pleasure. I love the scarf on the pink flamingo! I was at the Garfield Park Conservatory in the Jens Jensen room looking at the photos on the wall. They had a picture from '02 where they decorated the conservatory with pink flamingos and I thought of you. 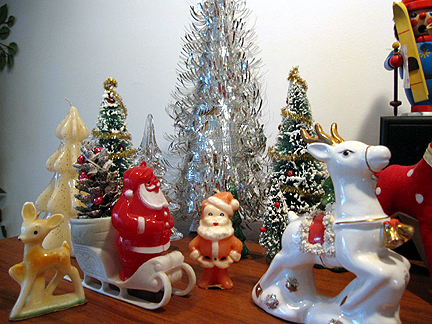 As someone who doesn't celebrate Christmas I have to say I like the style of your retro ornaments and can see why it took you a while to warm up to them. Monica, I love the Deers too. 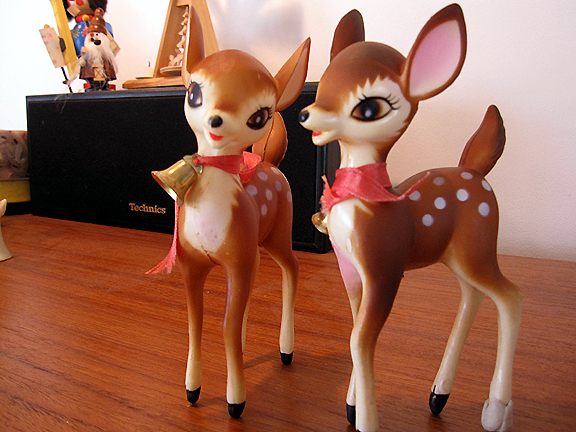 I like the way figurines were made in the 50's and 60's and even later..They have such a sweet innocents to them. I love your Christmas decor Monica! The flamingo is the ultimate. I love your Norfolk Island pine Christmas tree - the ultimate in an environmentally-friendly Christmas tree. I grew one from a tiny twig found at the grocery store years ago. It got to be about 4', and unfortunately got left outside too long several years ago when I was between houses. I miss it - might have to get another one. I haven't dragged out the Christmas decorations yet, except our Holiday Moose (mooses/meeses,) one for each year the Lawn Man and I have been together. Seeing your decorations might be the motivation I need to get moving. Everything looks so festive at your house. And I LOVE the blog snow. . . might have to borrow that! p.s. sorry I missed you all at the Christmas Market last week! I really wanted to come. pps - great header photo!